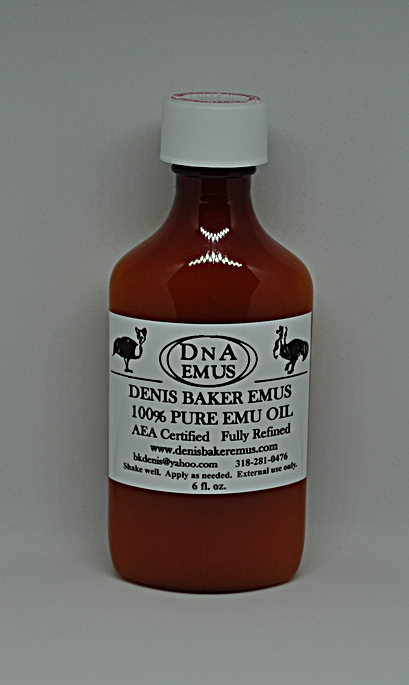 AEA Certified Fully Refined Pure Emu Oil 6 oz. Bottle. Sports Injuries and Joint and Muscle Pain and Stiffness. Emu Oil is also great for: Rough, Dry, Itchy Skin. Skin Care and Skin Disorders. Thin Skin, Wrinkles and Age Spots. Available in 5 sizes: 1 oz, 2 oz, 4 oz, 6 oz, and 8 oz.